Understanding how to ride in a crosswind requires a true understanding of the effects of the wind on a peloton and therefore the race. My experience at the Anchor-Point Tour of South west was the perfect way to gain a true firsthand experience of this. 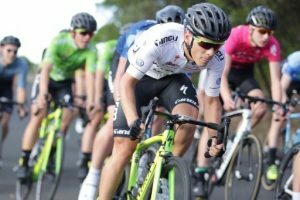 After riding the Tour of East Gippsland, I had a taste of some cross wind action and as a result I was even more eager to experience the infamous cross winds known to Warrnambool and the Anchor-Point Tour of South West. On the first night when we arrived, the weather was spectacular. We quickly got out on the bike and spun the legs out in preparation for the following morning – the individual time trial. Let me say that my first impressions of Warrnambool were very good. However I couldn’t help but think about all the stories I had heard about the treacherous windy conditions that the Tour of South West is so well known for. As I woke up on Saturday morning and looked out the window I knew I was about to find out how the Tour of South West had earned its reputation. It was blowing an absolute gale and I could see the rain clouds coming in over the bay. Still, with the boys all fired up and ready to race, we set out for the time trial. The individual time trial was held over a 12.5 km rolling course that had very little shelter from the wind and included one punchy hill in the final third of the course. At the start of the time trial a cold winter front had come across the bay and the wind was blowing a gale. To make things even more fun, the rain set in just before my time trial began, adding to the whole experience. With the weather not looking as though it would change, I took note of all factors that could contribute to my best possible performance. As with the nature of a time trial, you don’t have many opportunities to avoid the wind. 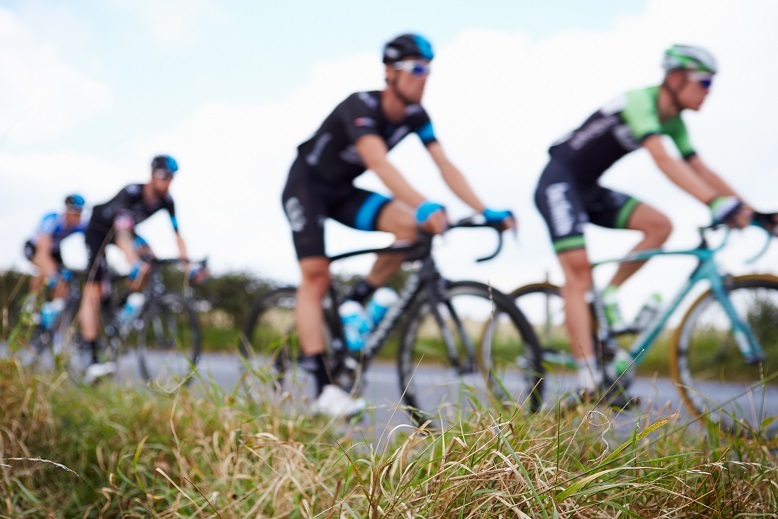 However by taking note of the surrounding vegetation lining the roads, the hills, dips and direction of the wind, you can definitely make up some marginal gains. Although it was only the third time trial I had ridden on what was a borrowed bike, and therefore only the third time I had ridden that bike, I rode reasonably well and placed 14th out of 75. Hungry for a stronger performance in the road race, I had a quick lunch and began preparing for the afternoon’s race. Stage 2 was in the afternoon and conducted around five laps of a very open and exposed course. The course had some rolling hills, but the difficulties came from the howling wind, wet conditions and narrow roads. From the word go the pace was on, leaving behind those inexperienced riders getting shelled off the back of the bunch to fend for themselves. As the course looped around there was only one section that held a head wind and therefore was the only section the race slowed up. The rest of the course provided some fun and technical, yet challenging, conditions. If you are unfamiliar with road racing, or haven’t raced in windy conditions yourself, you would assume that a head wind would be the toughest part of the race. In a sense it is, but for this reason the peloton doesn’t want to work as everyone sitting in the bunch behind the front riders gets a free ride. However, the moment the wind turned into a cross or cross tail, the tactics changed dramatically. Teams began to ride the gutter, that is; ride as close to the edge of the road as possible in order to stop any riders gaining a draft from the cross wind. 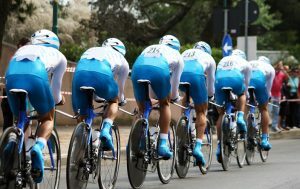 Essentially, the main focus while riding in a group is to avoid the wind at all costs unless you’re blocking the wind for a teammate, in which case you want to shelter them from the wind so that they can conserve as much energy as possible. As you can imagine everyone is trying to do the same thing, which means it is a constant fight for the best position. The group is constantly shuffling around as riders try to find a position out of the wind. This is when teams form an echelon to protect their own riders. The moment teams ride closer to the edge of the road during a cross wind, the less road there is left for other riders. As there is now no room in the front echelon, the only place to go is backwards which is open to the full force of the wind. Each lap that we came around, the group strung out on single file, which slowly began breaking down to form only a small number of riders in the main bunch. Riders were hitting off the front, the wind was howling and the roads were full of puddles providing a lovely third dimension to the already treacherous conditions. Before I knew it we were in the final kilometre and a small gap began to form between the two riders in front of me. Luckily I had one team member still with me and without thinking about anything other than getting to that next break of guys in front, I yelled for one last effort from him to get me up there. He rode extremely hard and got me within reach but there was still a gap. By this point we only had about 300 metres to ride and I had no choice but to start my sprint from behind. I bridged the gap but by the time I reached the group in front, the left-hand side was fully boxed out. This left only the right and windiest side to sprint home for the line. Being forced to sprint up the right hand side meant that not only did I have to sprint into the full force of the cross head-wind, but I also sheltered my competitors and essentially gave them an easier ride to the line. Unfortunately due to the circumstance I didn’t have a choice and after a long fought sprint, I pulled up just short in third place. The team were ecstatic. It was our first VRS A Grade podium and done in some brutal conditions. Although I was happy, with two guys in front of me I definitely wanted more! The tour provided a great first-hand experience of how a cross wind can make a flat and relatively simple course become the most tactical and exciting stage of them all.